5:50pm The following email was sent to the entire Yale community and details everything we know about the incident thus far. Looks like it may have been a deliberate or unintentional hoax, which is good news! As we announced to you via the Yale Alert system, the University has lifted the lockdown for campus. The incident began when an anonymous call was placed from a phone booth off-campus to the New Haven Police at 9:48 a.m.. The caller, who did not identify himself, told New Haven Police that his roommate had a gun on the Yale campus. New Haven police shared this information with Yale Police, and both responded immediately, scouring the campus and the location of the phone booth off campus from which the anonymous call was placed. A few minutes after the Yale Alert was sent to the campus community, a Yale employee called police to report that she saw a man walking on Old Campus with a rifle. It now appears that the man she saw may have been one of the early responding police officers carrying a rifle. Besides this caller, no one reported seeing a shooter or a person with a gun on campus. Nevertheless, we kept the campus on lock down while the search for a potential gunman continued. The combined police forces combed the area and have found no suspicious person. However, the police are taking nothing for granted. They are working to track down who made the first (anonymous) phone call and to interview thoroughly everyone involved. As the Chief of New Haven Police made clear in the news conference this afternoon, if it was a prank call that started this chain of events, the authorities intend to prosecute the individual to the fullest extent of the law. The safety of our community is our paramount priority. I want to underscore our collective thanks to the superb mobilization of the Yale, New Haven, and State Police, and the FBI, as well as Yale’s own Emergency Response team. I know this has been a stressful day for many, and I am grateful for the cooperation and patience of our entire community. 4:57pm The “shelter in place” order has been lifted for the entire Yale campus. No additional details available yet about today’s gunman scare. 3:30pm The lockdown has been lifted for Calhoun College but remains for Old Campus. This is a Yale Alert- today is November 25, 3:30 pm. The shelter in place/lockdown has been lifted for Calhoun College but continues for Old Campus. This is a Yale Alert- November 25, 3:10 p.m. the Shelter-in-place/lock-down is lifted, with the exception of Old Campus and Calhoun College. More info to follow by email. 2:42pm Perhaps not surprisingly, on-campus science seminars at the Yale Medical School have been cancelled this afternoon in reflection of “shelter in place” order. 2:19pm It’s now not entirely clear whether there is actually a gunman on the loose at Yale, or if this was a very sick elaborate hoax. The 9am call this morning was from someone who did not identify himself as a student. Police are now uncertain whether witnesses who saw a man with a rifle on-campus actually saw a gunman, or whether they saw police setting up the perimeter in search for the alleged gunman. 2:02pm At about 1:50pm, I received a call from Yale alerts on my cell phone. At the same time, I received the following alert in my email inbox. Police have begun door-to-door searches of on-campus dorms. Yale Alert- November 25- 1:45 pm- Out of an abundance of caution, Police will be doing a room to room search starting with the residential college areas. When they knock on your door, a Yale Police Officer will slip their Yale ID under the door. Please cooperate. In some cases, Police may use keys, but they will identify themselves. Shelter in Place continues. Gotta say, I appreciate this “abundance of caution”. 1:13pm Police have brought an armored vehicle and parked it on High Street (a residential and commercial street lined by several frat houses) between Crown and Chapel. It’s about a block from me. I would go take a picture of it, but I’m on lockdown. 1:06pm New Haven Independent reports that at 12:45pm, SWAT team and other law enforcement amassed at Crown and High St., following reports over police radio of a gunman atop a building within a block of that intersection. 1:03pm As many on Twitter have also pointed out, there are many students at Yale who don’t go home for Thanksgiving, including but not limited, to Yale’s large international student population. 12:47pm Many news outlets noting most students have left campus for Thanksgiving holidays. It’s worth noting that Yale employs many employees that are working on-campus right now and through this week; employees don’t get vacation until Thursday. 12:31pm New Haven Independent reports that the lockdown originates from a Yale student who called police to report that his roommate wanted to “shoot up” the university today. Police are searching for a man with a rifle or other long gun, according to a police spokesman. 11:55am Yalies received our second alert. We are currently in lockdown (which means no one is allowed to enter or leave the building). The reports of a gunman are now confirmed, and police are actively searching the Old Campus area, about 1.5 miles north of the first reports and basically in the heart of downtown New Haven. Yale Alert- Nov 25-11:55 a.m. There are confirmed reports of a person with a gun on campus on the Old Campus. The shelter-in-place/lockdown continues. Teams from Yale Police, New Haven and the State Police are on the scene and are actively searching for any gunman. THIS IS NOT A TEST. Call 911 with any information. 11:20am Yale reported over campus loud speaker the same message that police were actively searching for the gunman on-campus. Road have been blocked off. New Haven police, campus police, state police, and SWAT are on scene. This is a Yale Alert message today is November 25 at 10:17 am. 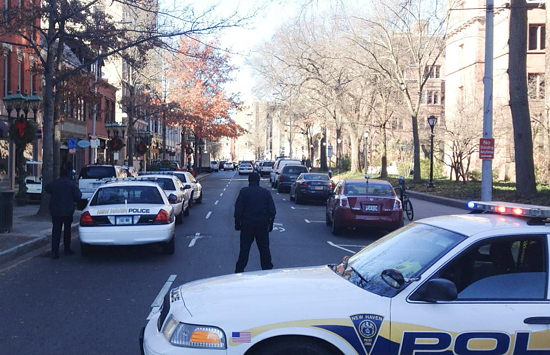 New Haven Police have received an anonymous call from a phone booth in the 300 block of Columbus Avenue (between Howard Avenue and Hallock Street) reporting a person on the Yale Campus with a gun. There have been NOT confirmations or sightings of this person. Yale and New Haven police are in the area. If you have information, please call 911 immediately. Yale Police advises those on campus to remain in their current location and shelter in place until there is additional information. It’s worth noting that Yale maintains a great emergency alert system. In fact, it’s tested often, with my latest test message sent to my cell phone as recently as last Friday. The area cited above (Columbus and Howard) are in the southern part of the campus, in the Yale Medical Campus area.